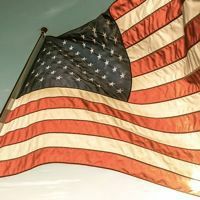 The Corvette legend is full of larger-than-life personalities, corporate politics, and several attempts to cancel the Corvette program outright. Ludvigsen's complete history of the C1, C2 and C3 generations explores it all-from the tactical maneuvering of Harley Earl, Ed Cole and Maurice Olley to get the first Corvette Motorama cars built in the 1950s to the power struggles between John DeLorean, Ed Cole and Zora Arkus-Duntov over a mid-engined Corvette in the 1970s. GM's various marketing strategies for the Corvette are also outlined in detail. The star player, of course, is the car itself. Ludvigsen painstakingly traces the evolution of its design, its structural engineering, and its power and performance-including extensive coverage of Corvette racing at both the amateur and professional levels. Technical drawings and colorful promotional photos of each production model are wonderfully balanced with superb shots of racing Corvettes and their drivers in action. Also new for this edition are the author's insights into competitors like the Bricklin and Pantera. Newly researched sidebars describe the influential LaSalle II concept cars, Bill Thomas's Cheetah, Zora Duntov's European years, custom bodies on Corvettes, the St. Louis plant, the author's impressions of CERV II and Bill Mitchell's personal views on the Corvette. When it was published in 1973, Star-Spangled Sports Car broke new ground as the first book devoted entirely to a single car model. 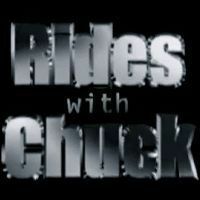 It has since been credited with helping to kick-start the exciting Corvette hobby. 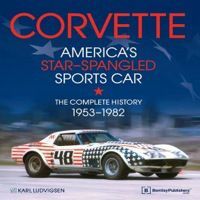 Four decades after its original publication Classic and Sports Car declared, "Karl Ludvigsen's Corvette history remains the bible." 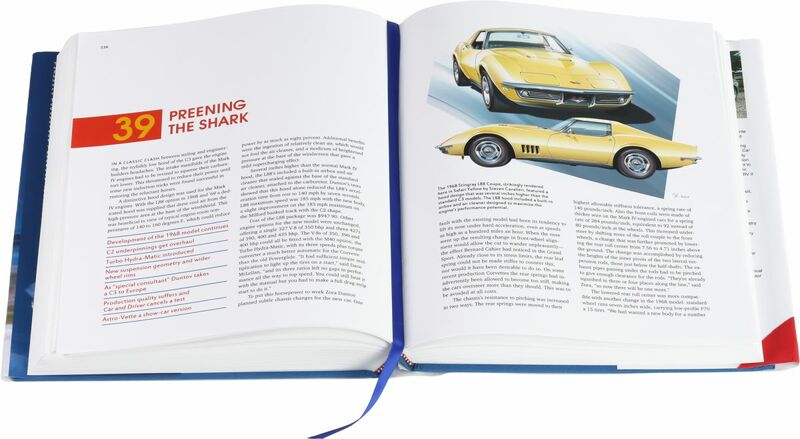 What makes Corvette - America's Star-Spangled Sports Car: The Complete History, 1953-1982 unique is the fact that Ludvigsen does not stop at recounting what happened or cataloging model-year changes, equipment options, etc. (though these facts are well covered). He has added depth to the Corvette story through his desire to understand why the Corvette evolved as it did. Drawing on his many years in the industry and his expertise as an automotive historian, Ludvigsen takes the reader behind the scenes to reveal an insider's view of the people and events that gave rise to America's favorite sports car. Frustrated by GM's adherence to the Automobile Manufacturers Association's 1957 ban on corporate support for automotive racing, to the detriment of the nascent Grand Sport Corvette. Zora Arkus-Duntov arranged for the five prototypes that had already been built to be made available to carefully selected race teams. 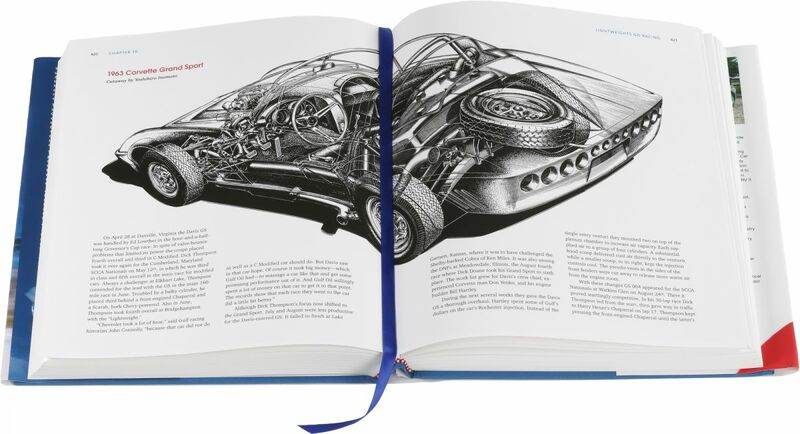 Chapter 30: Lightweights Go Racing tells the story of the technical challenges these prototypes faced in their first racing season, with racing and technical illustrations like this cutaway of a 1963 Corvette Grand Sport by legendary automotive artist Yoshihiro Inomoto. Despite struggling with internal divisions within GM, Zora Arkus-Duntov was able to take pride in a clear sign of success when the brand new third generation of the Corvette sold out its 1968 production run. In Chapter 39: Preening the Shark, Ludvigsen writes about the design, development and introduction of this new Corvette, commonly known as the C3 and seen here in this opening illustration by renowned automotive artist Steven Cavalieri of a Safari Yellow 1968 Stingray L88 Coupe. 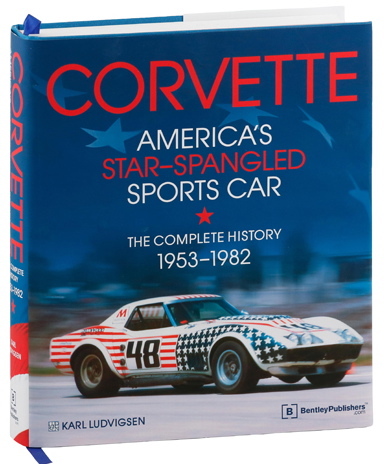 Buy the book : Corvette - America's Star-Spangled Sports Car.